A funny yet heartwarming depiction of a cosy-looking brussel sprout looking very much at home at Christmas. The cards were originally hand-drawn in our Kent studio. 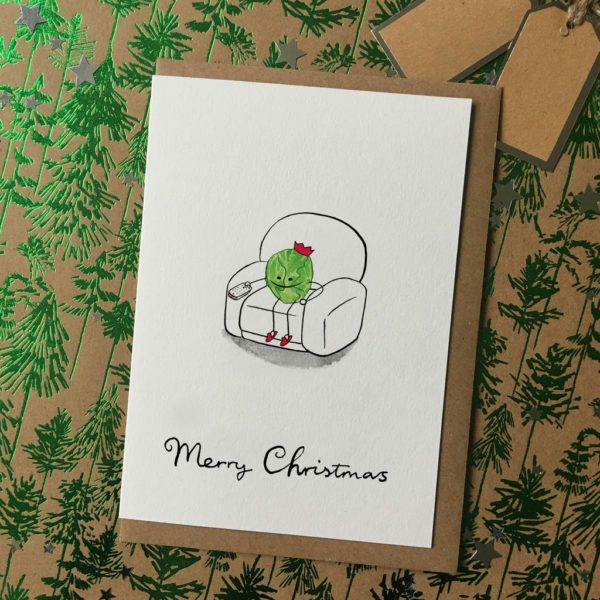 This funny Christmas card is perfect for anyone who loves or hates brussels sprouts. Funny cosy sprout. Lovely illustration by Peter Gander. Supplied with eight recycled Kraft envelopes. Made from: High quality card, envelopes are recycled brown-fleck Kraft.